Steve Banks and Clive Carter have created a new must have book for the LNER enthusiast. 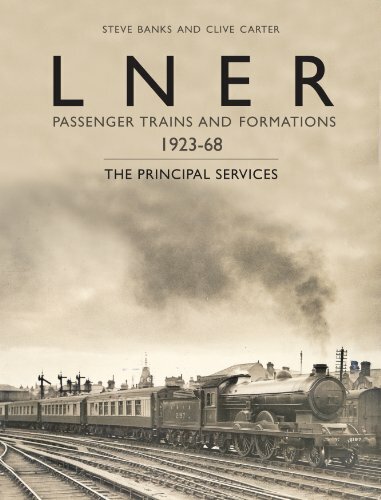 LNER Passenger trains and formations 1923-67 gives a comprehensive guide to the principal services of the LNER and BR Eastern and North Eastern regions, along with the Scottish expresses from the grouping to the end of steam. With the arrival of DCC and with the vast amount of high-quality ready-to-run equipment now available from the major manufacturers, it is increasingly easy to replicate correctly in model form the operation of the full-size railway. This volume fulfils the need for authoritative but accessible reference material to the subject of railway operations for all those who wish to model the LNER. With the plethora of locomotives and rolling stock now available, it is increasingly practical for most modellers now to be able to recreate faithfully the actual consist of the services that they are replicating in miniature. Little has been published however for the modeller which covers the actual composition of specific trains. This is where this carefully-researched and detailed study comes in; it provides a record of the composition of the major passenger trains operated by the LNER and its BR successors from Grouping in 1923 through to the end of main line steam in the late 1960s. It covers the expresses – such as the ‘Flying Scotsman’ – through coaches and portions, cross-country expresses, secondary expresses, sleeping car services, Pullman trains and later developments (such as later named trains like the ‘Master Cutler’ and the ‘Elizabethan’). The book includes c75,000 words of text allied to c300 mono and colour photographs.